Art was born in Ciudad Juarez, Mexico, but came to the United States legally with his family when he was eleven years old. When he was a senior in high school, a friend from work invited Art to a local Baptist church where he heard the Gospel and later received Christ. While studying to be a clinical dietitian at the University of Illinois in Chicago, he attended Moody Church. 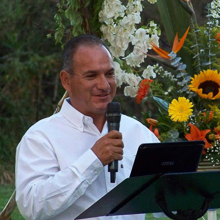 There, Art met his wife and became involved for the first time in ministry to Hispanics. Art also served as a deacon at Moody Church and helped a church planter in a Mexican neighborhood of Chicago. He was employed by the Westlake Community Hospital and later the Norwegian American Hospital in Chicago as a clinical dietitian and diabetes educator. It became Art’s desire to return to Mexico to share the Gospel. Then Art and Vicki became missionaries with TEAM in May 1992. Vicki became a Christian when she was thirteen years old in a small town in northeastern Pennsylvania. She later attended the Bloomsburg University of Pennsylvania and earned a degree in education and a Masters of Science in the Education of Exceptional Persons. She taught in private and public schools in Pennsylvania. One summer, while on break from her teaching responsibilities and while visiting friends in Chicago, she felt that the Lord was calling her into missionary service. The following summer, she served as a short term missionary in the frontier area of Kenya. Vicki moved to Chicago to finish her Bible requirements at the Moody Bible Institute and was employed at Moody Church where she met her husband Art. She taught at Wheaton Christian Grammar School before the family left for Mexico with TEAM. Art and Vicki became career missionaries in 1992. Art and Vicki are passing the baton to the Mexican leaders of Emmanuel Evangelical Church of Los Cabos as they plan to leave in May 2013. They also began church services in the nearby town of La Playita in August 2012. Emmanuel Evangelical Church is made up of Mexicans from all over the Republic and expatriates from Latin America and Europe. About one-third are middle class professionals, one third are a stable “moving-up” working class, and another third are considered poor. Most came here to work in the tourist business or related fields. Mexicans here are open to the Gospel! The La Playita Church started in August 2012. Most of those that attend are not native to the town. It is a hard area to reach for the Lord, due to traditionalism mixed with superstitions. Please pray for wisdom for La Playita ministry- especially how to involve Emmanuel Evangelical Church in the work there.